If you want to make spelling easier for your child or boost spelling skills and confidence, you've come to the right place. 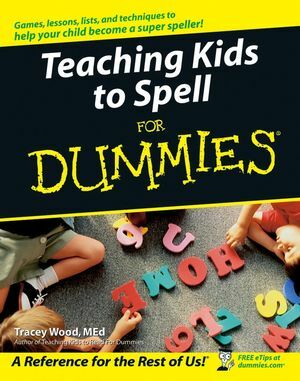 Veteran reading specialist Tracey Wood gives you tips, games, exercises, word lists, and memory aids to help your child build solid spelling know-how. Her techniques are fun, fast, and effective, and best of all, they're not boring! Tracey Wood, MEd, is a children's reading specialist and former teacher. Her books include See Johnny Read! : The 5 Most Effective Ways to End Your Son's Reading Problems. Part I: Understanding the Basics of Good Spelling. Chapter 1: Thinking Like a Spelling Teacher. Chapter 2: Understanding the Reading, Writing, and Spelling Mix. Chapter 3: Getting to Know the Pieces and Parts of Spelling. Part II: Getting Easy Words onto Paper. Chapter 4: Spelling with Short Vowels. Chapter 5: Blending Letters Together. Chapter 6: Choosing ch (and sh, th, ph, and wh, too). Part III: Coming to Grips with Long Vowel Sounds. Chapter 7: Putting a Firm Pen on Bossy e.
Chapter 8: Taking Charge of Words with Two Vowels Together. Chapter 9: Writing y Instead of a, e, or i. Part IV: Using Word Families. Chapter 10: Getting Into Word Family Mode. Chapter 11: Guiding Her Pen to Bigger Word Families. Chapter 12: Spelling Sight Words: A Different Family. Chapter 13: Being Vocal about Silent Letters. Chapter 14: Spelling Some Letters “Softly”. Part V: Spelling Words in Chunks. Chapter 15: Cheerfully Chunking Sounds. Chapter 16: Finishing Off with Suffixes. Chapter 17: Spotting What’s in a Contraction. Chapter 18: Ten Word Families. Chapter 19: Ten Ways to Correct Your Child’s Spelling. Chapter 20: Ten (or More) Group Activities That Rock. Chapter 21: Ten Spelling Games for Car Trips.